Getting on your way involves a lot of moving parts, many of which we often take for granted. Some you barely ever need to worry about, and others need a little more care and attention. Even the most quality, world-class vehicles need a bit of maintenance now and again to keep them in peak condition for all the years you'll drive it. On of the most important parts to that is what is in constant contact with the ground, playing a crucial role that encompasses everything from providing traction to absorbing shock-your tires. Tires see a lot of usage, more than most individual parts of your vehicle, and considering how important they are to not only your daily reliance on your vehicle but your safety within as well, it is a necessity to make sure you are well equipped to face the challenges the road puts before you. Quick changes in temperatures and weather call for the best tires to handle it-and face it, in Canada, the seasons sure know how to throw us a curveball. 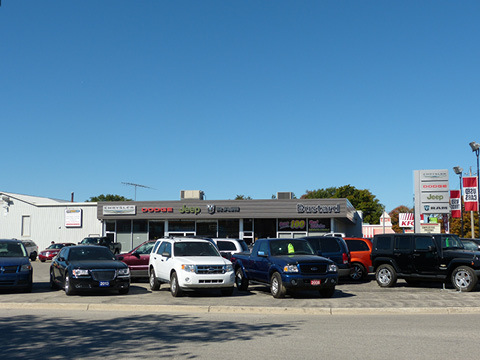 For the best tire selection and deals in Waterloo or anywhere else around, come to Bustard Chrysler. We have an outstandingly wide range of tires fit for not only Chrysler, Dodge, Jeep, RAM and Fiat vehicles, but for other leading brands such as Toyota, Ford, Honda, Chevrolet, and more as well! You name it, and chances are we have the right tires to match your make and model, so come check us out! We carry tires from across all major brands like Michelin, Goodyear, BFGoodrich, Bridgestone, Dunlop, Uniroyal, Yokohama, Firestone, and much, much more! Our selection is easily searchable from the convenience of our website. Simply choose your year, make, and model, and you'll get a quote right away, which you can email and save for later, or even request an appointment so they're ready for you when you stop by! Located in beautiful Waterloo, Ontario, we proudly serve our community and surrounding areas like Kitchener, Cambridge, Guelph, Hamilton, and all of Southwestern Ontario. Make Bustard Chrysler your go-to spot for all of your tire-related needs! Don't let yourself get caught off guard! Your tires are pivotal to the optimal safety and effectiveness of your vehicle. Making sure they are in top condition is never a bad idea, and we are fully equipped to be of assistance. At Bustard Chrysler, we do a lot more than just sell cars and tires. We are tire experts that also provide a full range of tire-related services like tire rotation, alignment, and pressure monitoring. What's better than driving off with a fresh new set of tires on your favourite vehicle? Getting a marvelous deal out of it, of course! At Bustard Chrysler, we are the masters of great deals on tires-in fact, we are the original home of the 'Buy 3 Tires and Get the 4th Tire Free'! Purchase three new tires from select brands and we'll throw in the 4th one free of charge-and we'll even install them for you! To get the most out of your tires, it's not always just about the tires themselves. Make an alignment inspection appointment with Bustard Chrysler today and we'll provide a full inspection of wheel alignment, front and rear suspension, the steering component, as well as provide a full written report and Manufacturer's Check, all at an low, affordable price that will take a load off your shoulders. Call us up or book your appointment with us online today! Has that tire pressure light been at it again? You've inflated your tires to the proper PSI but it's still lit, indicating there's an issue? It could be a simple issue with your vehicle's sensors, but for your optimal fuel efficiency, handling, tire longevity and especially safety of you and your passenger, get in touch with our expert and certified technicians and we'll look into what the issue may be. Have any other issues or concerns regarding your tires? Do not hesitate to call up our service department today!